Feeling anxious lately - in a general way. It happens sometimes - these stretches where sleep is elusive and I get lost in self-navigating: do this, then do that, then do that. Mental checklists for even the simplest things. It's nice when it's all more automatic. When the days flow, and nothing is a surprise. When there is order and predictability, a clean kitchen, no clutter, and a properly annotated calendar looked at days ahead of events, hours ahead of meetings. When plenty of sleep was had the night before, and the day started with fruit, and maybe egg whites. It's fictional, mostly. Days like that. I have heard of them, and their Type A bearers. I crave them, even. I imagine them to be easier - a kind of mental blue sky bliss where there are clear routines, and some outcomes, at least, are predictable. Wednesday, last week, I laid out Annabeth's Thursday clothes. That much, I do. It is me striving for order (and me harkening to a childhood full of paper dolls - and never knowing quite what you were supposed to do with Barbie after she had tried on every clothing combination in her mini wardrobe). It happened that Daisies were on Thursday, so with her clothes I also laid out the mini IHOP apron with the unfinished flower ironed on in the middle. The flower center she got when her troop memorized the abridged version of the Girl Scout Promise. Nothing in there about being prepared - but it is implicit. 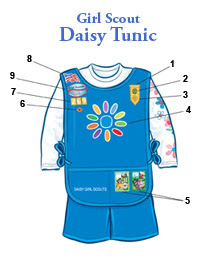 Daisies are an add-on, an introductory troop. Pre-brownies, they are bright blue and optimistic. They earn their badges - flower petals - as a group. The apron tunic thingy was rumpled because she had only just taken it out of her bookbag from the week before. This made me angry. I scolded her. Harshly. Responsibility and keeping things nice and a uniform and putting things away and blah and blah and she looked wounded. "A lot of girls don't wear theirs. So I took it off." "No. Not an option for you. It is a Uniform. You wear yours. I don't want to hear anything else about it." The next morning, she put it on. Pressed. Over a pressed light blue shirt. Khaki bermuda shorts. Plaid tennies. In the afternoon, I picked her up. At her request, I had let her go to after care after Daisies. She ran up to me. Apron-less. "Annabeth...?" With a raised eyebrow. "Mom, Daisies weren't today. Or last week either. Can't I just not wear it on Thursdays when there is no Daisies? No one else has to." Two weeks in a row, I sent her to school in her irrelevant Daisy uniform. Twice, she had to save face alone. Feeling, no doubt, a little silly. Like I felt, hearing it. Daisies, I then learned (and no doubt had been explicitly told before - in person, via email, and on some printed something or another by the far more organized Daisy moms) are on the FIRST THURSDAY of every month. And next Thursday? I will Be Prepared. there are pills and I will share. i kid ... sort of. ps and Barbie sometimes made out with Ken. You are making her stonger, this lesson will serve her in her moments in college when she is wearing the wrong something. Welcome to womanhood!